Exchange Mailbox to PST Converter Role to Repair Corruption! Exchange mailboxes play a vital role for recovering mails, contacts groups, scheduled appointment, calendar entries, lists, notes and other information. Convert mailbox to pst from exchange server to handle all instances of mailbox corruption and easily avoid permanent disabling of mails & other data stored inside. At this point, tackle all problems using a finest mailboxes Converter tool. Read: Why Mailboxes Stops Working Properly? Virus Attacks & Hard Disk Failure: Bad sectors in hard disks or local system virus attacks usually generate errors. Size Issues: Increase in mailbox size more than its allocated memory will lead to corrupted emails & other messages stored inside. Wrong Entries Log: Missing or deleted log entries will cause corruption. 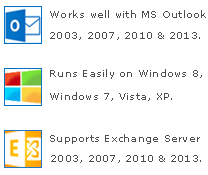 Download to tackle all issues related to Exchange Server stored user mailboxes (read all features). The Exchange converter is one of the finest applications which authentically repair corruption from mailboxes & stored mails. The application is especially designed to handle all Exchange server calamities. Without manipulating original emails data value, the software works efficiently. Handle Issues during Co-existence & Transactions: Actively extracts and changes the mailboxes into Outlook PST which failed during transitions & coexistence. Sustain Data Integrity: Retains original internal structure of mails and folders, also aptly maintains data integrity. Export Mailboxes to PST from Offline EDB: The Exchange EDB Mailboxes to PST converter tool intelligently extracts emails from Offline, disconnected, soft-deleted, disabled and unmounted EDB files. Change Mailboxes from Dead Server: Judiciously extracts mails when Exchange server is crashed, dead or in dirty shutdown state. Repair Corrupted Mailboxes: Repair corrupted emails header, message body and convert mailbox to PST from exchange server after repairing all non-functional elements completely. Restore Deleted or Missing Items: Works for deleted items recovery and conversion of deleted as well as missing mails into Outlook PST. Convert Mailboxes over 2GB or More: Easily export mailboxes into Outlook PST file exceeding 2GB size. Additional Benefits of the Software! The basic Role of Exchange Mailbox to PST Converter Tool is to solve the above mentioned issues and yield correct results. Additionally tools supports, emails corruption recovery, save folder structures (of inbox, outbox, sent, deleted drafts etc) and attachments.